to wait for paint to dry. 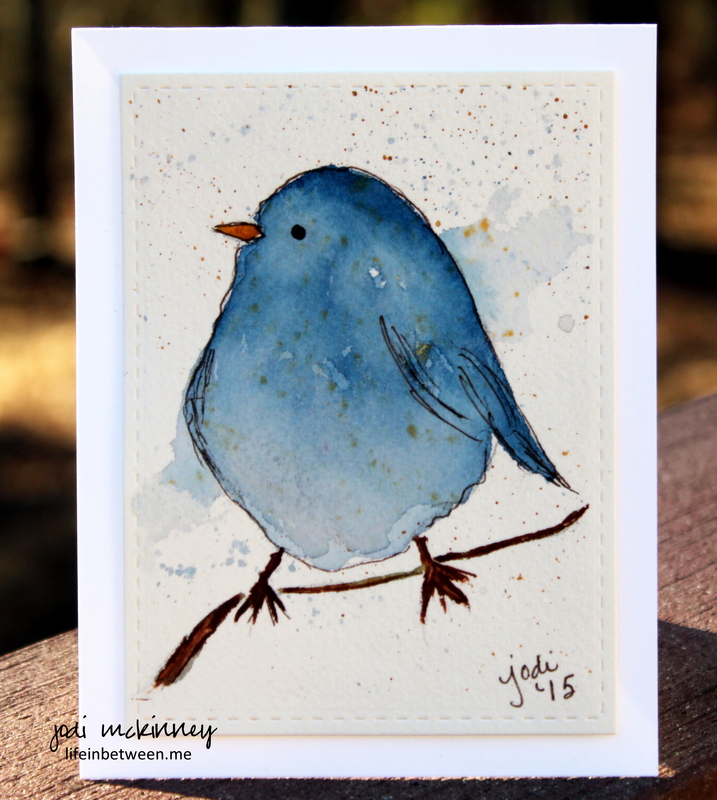 My Winsor & Newton Prussian Bluebird of Happiness! Jodi, you should see my biggest girls face when she saw your bird 🙂 She loves it! Awh! 🙂 How old is she Ilze? It’s beautiful and so elegant! he was fun to do – I’d like to do him in other fun colors too – but you know I was stuck on Prussian blue this week – hehe! OH WOW Jodi I want this little bird 🙂 I can just imagine him singing with all his heart from his perch in the tree. He is SO CUTE! Great job! LOVE, LOVE, LOVE this card! Beautiful!!! Adorable little bird! You are getting so artsy fartsy! I love seeing your new painting projects – keep it up! I Love it Jodi! Thanks Carol! I will try to do 🙂 Your grandbaby is BEAUTIFUL! Congrats!! So cute :-). And a very awesome blue indeed! I love Prussian Blue too! And your tweet birdy! 💙💙💙 It sings Jodieeeee! 🎶😊🐦 Happy Friday! Your little bird is just adorable. Prussian Blue is a great color ~ love using it in winter scenes too. what sweet things to say, Catherine! thank you! Very impressive for a “waiting for paint to dry” project! Dang! I am? No, I didn’t see that! That’s great! Jodi–wow i love that color. Hi, Jodi! I just lost my little cordon bleu finch recently and when I saw this art print of your little bluebird of happiness it melted me because it reminds me so much of my little Skylar. I had him as my little buddy in my kitchen/dining area for at least 12-14 years. Missing him. Do you sell this print? I would love to have it as a keepsake of Skylar. 💕. So wonderful!